We were happy to help bring Papa John's Camaro home. We were pleased this led to Camaro owners getting 35,847 free pizzas. We were not excited to hear that this led to the death of one Camaro. I have been following the Papa johns story on your website and was happy to here not only was the car found but Camaro owners would get free pizza. I have a 1979 Z28 that I bought when I was 16 as my first car (am now 23). Its been an ongoing project of mine, the body isn't pretty but the interior is good and I put a 396 BBC in it. So Aug.26 rolls around and I get in the car and we go for our free pizza. On my way home I am going through an intersection when a young girl coming the other way decides she has more than enough room to make a left hand turn. She didn't. I plowed into her without even a chance to hit the brakes. As you could probably imagine this was not beneficial to the looks of the car. Everything front of the firewall needs to be replaced, motor excluded, so the car is pretty much finished. 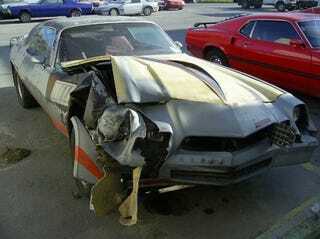 That's my story of how free pizza killed my Camaro. We're sorry, though on the bright side you did wreck it after you got the free pizza.